I’ve been in Corsica for about two weeks now and that is how you greet the new year. Peace and health. I will add love to this. And I believe that the road to peace, health, and love is self discovery. Self discovery is January’s theme on Atelier Doré – and I believe it’s a little bit the theme of my life. When I offered a retreat with the theme of self discovery, I didn’t really know what I was doing – I just knew it would be an adventure. For the first time I was opening the spiritual gates and daring to talk about meditation and even astrology, which are tools I have always been interested in, but have been too shy to talk about. What I found on our retreat was above and beyond my wildest wishes. Not only did I find myself, but I also found others that were on the same path and who understood me. The adventure became one of the highlights of my life. And I understood that being ourselves, in all our strengths and vulnerabilities, if only for a moment, is the beginning of peace – and feeling at peace became one of the three most important things of my life. Meditation teaches me to feel my agitation and to settle my mind. Astrology is a guide which has been surprisingly helpful throughout my life. Over the years it has become a tool for discovering myself and understanding others. Maybe I’m idealistic but I think that if humanity had more access to interior peace there would be much less destruction around us. Not this new constriction instrument that’s becoming “wellness” even if there are many good things in it – things like infrared sauna, let’s say! To me health is about intuition and being able to dive into ourselves. Only you know if you’re keto or vegan. I have known happy vegans and others who are anemic – there is not only one way to be healthy. Some need therapy, others pray, others shop. Heal the way that feels good for you – no shame. I used self deprecation as a way to heal for a long time, but right now I feel calm and reflective. Less funny. I try to welcome and embrace all methods. Don’t let anyone tell you there is a superior way. I will always be in love with love. I am a forever romantic. But I finally have learned that love is supposed to make us feel good. Suffering is not loving. Suffering is just suffering. Love, wether it’s the person we spend our life with, our family, our friends or even our pets, love is supposed to bring peace and health. There can be hard times and mountains to cross. But if the storm keeps on forever, then it is not love. It’s something else and we are free to chose to live in it of course – but it’s important to know that it exists, this healthy, particular, elegant love that gives us joy and allows us to be our true self. It exists. Love is loving people through their changes and accepting that sometimes a relationship has to change too. It’s welcoming the flaws but knowing yourself well enough to know which cracks we won’t be able to survive. Lastly, peace, health and love are very simple things we make very complicated and they have nothing to do with exterior success the way it is presented by society, as the only option. So in this new year all I want is to wish you Pace, Salute e Amore – and the key to get there because I just found it: self discovery. Merci pour ces jolis mots Garance, comme d’habitude ils sont extrêmement justes et raisonnent en moi. Merci pour tes mots et belle année à toi. J’ai mis du temps aussi à assumer certaines choses que j’aimais, comme l’astrologie, les planètes, les énergies, certaines parties de moi en fait, ce qui revient au fond à dire que j’ai mis du temps à assumer qui j’étais vraiment et c’est fou comme cela a été libérateur, d’abord parce qu’on goûte à un calme intérieur jusqu’alors inconnu, ensuite parce qu’on attire ce qui nous correspond vraiment, ce qui vibre à la même fréquence, comme sur une ligne parfaitement tracée et pas brouillée entre ce que je suis / ce que j’essaye de paraître, qui ne fait que semer de la confusion en nous et autour de nous. Désormais, en étant nous-mêmes, on attire à soi les gens qui nous correspondent, les situations et évènements dont on rêvait, qui vont nous “servir” dans notre parcours de vie, et tout ça a une saveur incroyable. En gros, quand on est authentique, la vie devient magique. Je ne dis pas ça pour faire joli, je le vis et j’en suis à chaque fois bluffée. Thank you for these wonderful words to begin the New year and for sharing your self discovery experiences. The answers and the light are within us and understanding ourselves and finding that peace makes it so much easier to be content in this world. It has been a joy to accompany you on your journey and to watch you mature, peeling away the layers of society’s expectations and getting to your true self. Not everybody manages it; many remain wrapped (entombed?) in artificiality. Bravo to you. You are an inspiration. Dear Garance, Thanks for the message you posted here and also on your Instagram. I very much respect you for being a truth seeker. Wasn’t it Shakespeare who said:”To Thine Own Self Be True”? That is a life-long process and we are all on the same journey if we are fortunate enough to be awake. Bonne chance et bonne année! Garance, I have so enjoyed the way your blog and artwork has developed as you have stayed so close to your truth. It is liberating to find such loving, caring words this morning, amongst the many blogs with adverts and sales. I have liked to see your voice, both personal and professional, grow here. As we are same age, your words and life experiences, though different in context, are same in moving forward with grace while embracing the past. Happy New Year and wishes for prosperity and health with calm and peace. 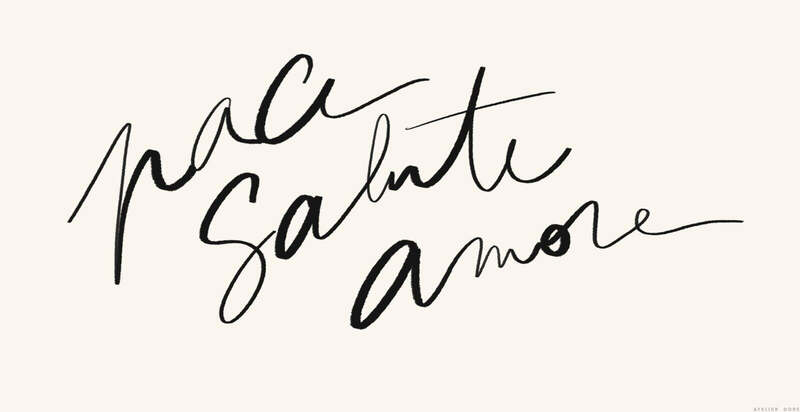 Pace, Salute, Amore : de belles resolutions a prendre en 2019. Bonne Annee, joyeuse Garance ! BIG LOVE TO YOU, GREAT GARANCE!!!! ICI BARI, PUGLIA! VIENS!!! A big Y E S to all of this and to everyone learning more about themselves to find inner peace… thank you for sharing your journey and wishing you much pace, salute, e amore for 2019! ?? Tenham um *Excelente ano , Garance and Team ! That’s really beautifully said Garance, the way of loving ourselves and learning how to find all these things you wrote not easy. Happy you writing about this, and looking forward to read more about your reflections. The only path to peace, health and love is to open your heart. If self discovery fills your ego or leads you to fake minded disneyland, forget it. Plunge in your emptiness and dance ! Don’t make a business with your soul ! Have a groovy year ! I’ve re-read attentively your latest posts, here and on your Insta profile. With and admirable braveness – I wouln’t have ever had it – you shared with us, the Readers, the most intimate development of your personal life. The answers show that, in these years, you’ve gathered around you a group of friends – not necessarily the more frequent replyiers – that has perceived and appreciated that your transparency is revealing of an uncommon deepness of thought. The mere fact that this could have happened through a screen shows also that there’s a group of Readers waiting not only (may I say: more than?) for style and fashion, but for a real and openhearted conversation about life and ageing. Yes, ageing: how it happened that a blessing has become something to conceal? How it happened that someone is “socially acceptable” (whatever that means) if she’s 50 but she looks 30? if she’s 70 but she looks 50? We can’t escape that we are living this life at this time: every other day carries joys and pains and, if we accept the challenge, we must develop with it. Pardon me this unusual long comment, but I sensed that you’re gone through the looking glass: beyond the mischievous surface of “high life” to the much more fascinating continents of human life. Pace, Salute e Amore anche a te. Happy New Year!!! And I wish you and all of us one real, true and unconditional love. très belle et douce année 2019.
je te lis avec attention et je partage ton opinion. J’ajouterai uniquement qu’en plus d’apprendre à se connaître, il faut également ne pas avoir peur des conséquences de ce que l’on découvre. Je crois que c’est une grande peur pour beaucoup; être capable de vivre en accord avec ce que l’on est réellement ! en tout cas plus j’apprend à savoir ce que je veux, plus je me questionne sur les implications qui en résultent… Mais bon comme tout à chacun on avance pas à pas! Merci Garance et hâte de partager la suite de tes aventures ici! Juste MERCI Garance. Je suis encore trop encombrée de souffrances entre une vie de couple douloureuse et un boulot qui ne me correspond plus… 2019 s’offre à moi comme une année du changement mais honnêtement je ne sais absolument pas par quoi commencer. Je commence alors l’année un peu perdue mais tes mots me font échos et beaucoup de bien. Alors pour ça, merci. Tes articles sont mes preferes; de loin…( meme si les autres sont supers, et inspirants!) car ils resonnent a chaque fois en moi, ils me parlent, j’aime ta sincérité, ta facon d’ecrire. ton chemin personnel est vraiment interessant. J’aime ta générosité quand tu partages tes joies et tes peines. Tres belle année a toi et a toute l’equipe. Love your writing, as always! And yes, Peace, Health & Love. Bonne année Garance ! Pleine de paix, de santé et d’amour (tu as tout dit avec ces trois mots). Merci infiniment de ce partage de tes ressentis, au fil des posts, qui résonne tellement en beaucoup de nous (en tout cas en moi). Tu me fais du bien !! Je te souhaite aussi un belle année 2019 Garance. T’es mots sonnent juste, je ne peux que te les retourner pour cette année. Je suis moi aussi convaincue que la connaissance de soi apporte la sereinite, la paix, la santé parce qu’elle émane de notre bien être intérieur et l’amour bien sûr. Au plaisir de continuer à te suivre et te lire.